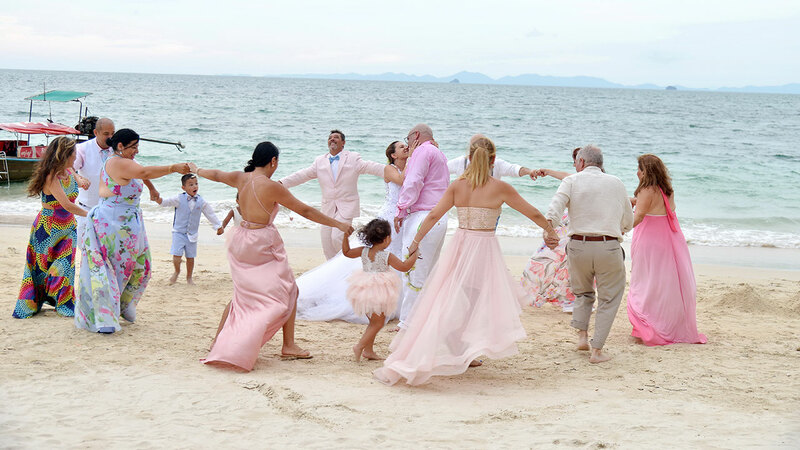 Are you looking for a unique wedding that you will remember for a lifetime (not to mention make all your friends back home jealous)? Then consider trying the knot with our company special Thai + Western Wedding Package. 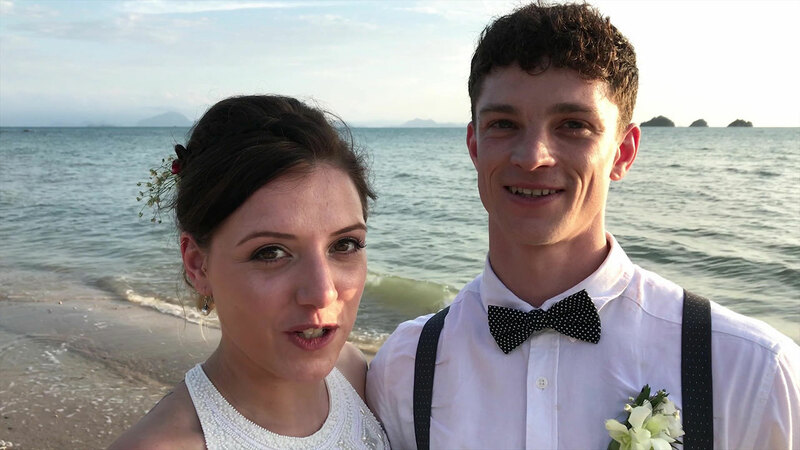 Available Wedding Ceremony Package @ Krabi , Lanta Island , Bamboo Island , Koh Jum , Phi Phi Islands , Railay Beach : Thailand. 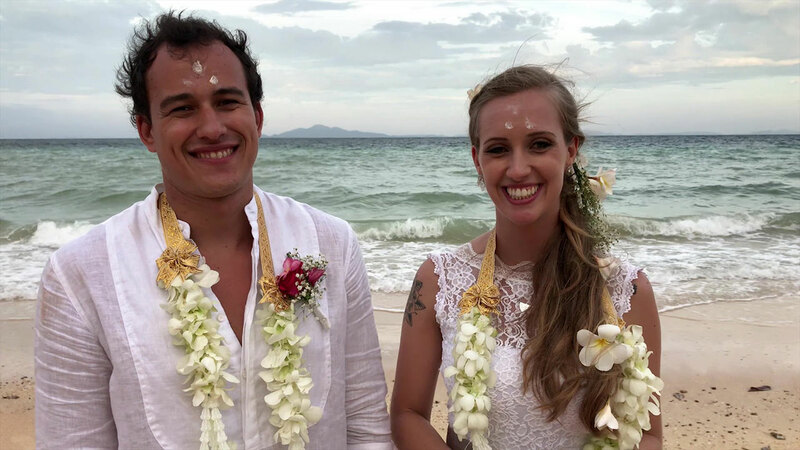 Featuring the best elements of both cultures, part of this ceremony takes place on Samui Beaches, Beautiful Gardens and National Park, known for its peacefulness and spectacular sunsets or other place on your request. 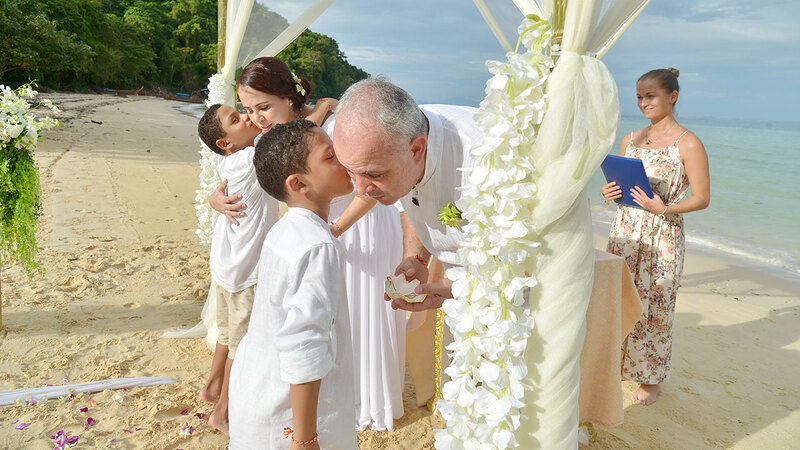 First step, we offer a most memorable Thai Buddhist Blessing with the preparations of offerings packages to the monks on the sandy beach, set up especially for the occasion inside the decorated gazebo to begin by prayers and chanting by the Monks. You will then be seated directly in fromt of the Buddhist Monks, where you will receive the blessing of the head monk. The monks will begin chanting, beautiful Buddhist chants. After the chanting you then join hands in poring the holy water from a small bottle into a bronze bowl that you give to the head Monk and will receive the holy water sprinkled lightly all over your body.You will then give the Monks simple offerings to be blessed, and prayers will be said for you and all your family and friends. 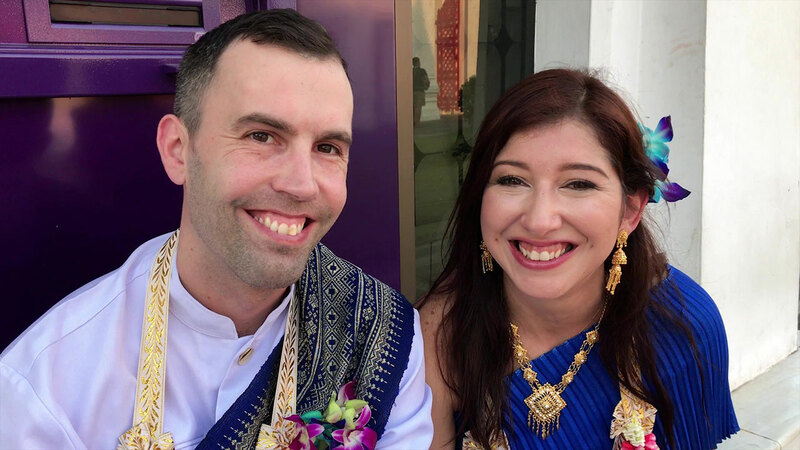 The Thai Wedding Ceremony includes beautiful traditional costumes, the blessings of revered monks, elegant dancers, musicians, elephants and several important rituals during which family members or friends will have an opportunity to take part (if it’s just the two of you, no problem, our smiling staff will help out!). As you go through each step of the ceremony, our experienced Master of Ceremony will explain the symbolism behind the different rituals. During the shorter Western Wedding Ceremony, the MC will lead you through the reciting of your vows, a nice poem, exchange of rings, the all-important kiss, Champagne toast and Love Tree Planting. This package also able to includes wedding cake, video recording and romantic dinner at restaurants. So again, if you desire something different in your wedding experience, you will be entranced by our Thai + Western Wedding Ceremony ! Traditional Thai Costumes for Bride & Groom and use of Thai Jewelry for Bride. 3 Buddhist Monks with blessing at the temple. Offering packages + fee and temple donation. The altar/2 aisles is set-up, venue floral decorations and archway. Thai Wedding Ceremonial Table where the bride and groom will be blessed. Staff Dressed in Traditional Thai Costumes. String of luck charm bracelets for bride, groom and also participants. Thai Wish Dance with Thai Music (Plug-in from iPod or iPhone) playing background during ceremony (Thai Ceremony). Marriage Cerificate from our company (Non official). Music Background playing during ceremony with Plug-in from iPod or iPhone (Western Ceremony). Пиша това за да помогна на всички, като нас с авантюристичен дух, които не знаят могал ли да се доверят на фирма, намерена в Интернет на другия края на земята. На тази можете. Справиха се много добре, много са открити, лъчезарни, определено се стараят, държат ниво и макар че има малки детайли които не са доизпипани и дразнят, като цяло са страхотни професионалисти. Фотографът им е перфектен, снимките остават незабравим спомен за цял живот. Искам да благодаря на Ной и на целия му екип за незабравимото преживяване. Всем, привет! Всегда мечтала о красивой свадьбе, и вот моя заветная мечта сбылась! Заказали свадьбу в компании Пхукет Discovery.Всё очень понравилось! Хотим выразить большую благодарность Ною и его команде!